You know when you misspell something in Google, they show a "Did you mean" with the correct spelling. Historically, Google has told us that even though they put that Did you mean in red, people still ignore it. So a a month or so ago, they decided to test enhancing the Did you mean feature. The enhanced version showed the correct spelling for the two top results and the remainder of the results were for the wrong spelling. 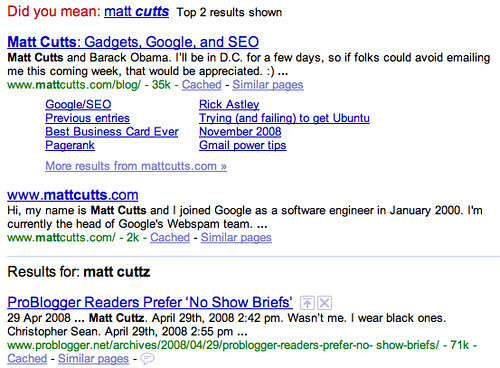 Here is an example of a search for matt cuttz versus the correct spelling of matt cutts. A WebmasterWorld thread took notice that this seems to always be the case now. Google seems to always be showing the new way of showing Did you mean results. Tedster added that he has been noticing an influx of "no results" found. 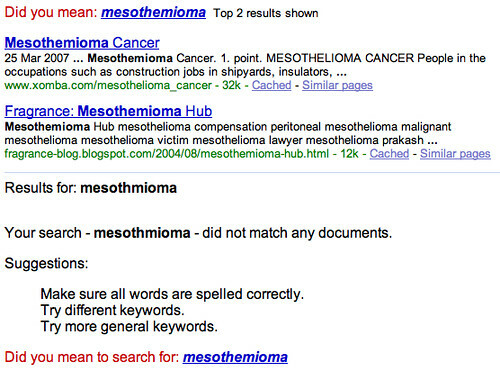 Here is an example for a search on mesothmioma, which is correctly spelled mesothelioma. The above example might be a bug in Google's spell checking software. Outside of the bug, it does seem like the enhanced version of Did you mean, is sticking around for a while. Previous story: Out Dated Sites Earning More Money with Google AdSense Then Fresh Sites?